There is nothing this girl likes more than sweets. Brownies, cookies, and anything fudgy fill my heart with a joy that only chocolate can. Alas, one day I'll master a healthy brownie recipe full of nutrients and fiber that validates my desire to eat them daily. Until then, I pass my time finding healthy ways to eat sweet things. Enter the witchcraft of coconut whipped cream. 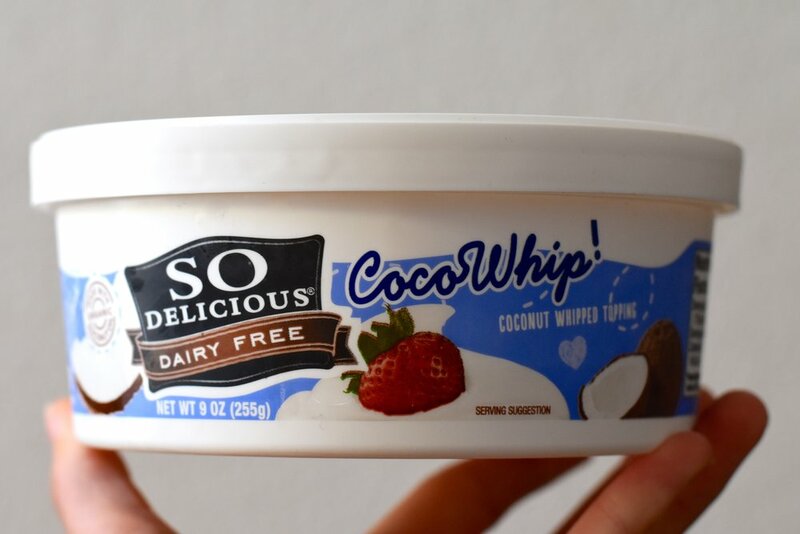 This coconut whipped topping is AMAZING. I am obsessed. It has been in my freezer for a week and is 80% gone. Luckily, my handsome man has no taste for anything that doesn't say Ben & Jerry's on it, so this container is all mine. Win! Given the creamy nature of this treat, I like pairing it with acid-forward treats like berries and stone fruits. These blackberries, plum, and strawberries were chopped into bite-size pieces and mixed with a squeeze of lemon juice. Add a dollop of the whipped cream. Eat the chocolate chips, have dessert, hug your humans. Life is an amazing gift. Get out there and enjoy it!